I wanted to play the marathon for the t8 US TD. But I get an "updater broken we are working on it" msg? Tried once more same message. Do you get this error message? Are you using the launcher or Game Centre? Just tried the Game Centre on my 2nd system and it's updating fine. Edited by Homer_J, 06 April 2019 - 01:02 PM. did you mean you tried to login and was told to update and tried to use the in client updater ? 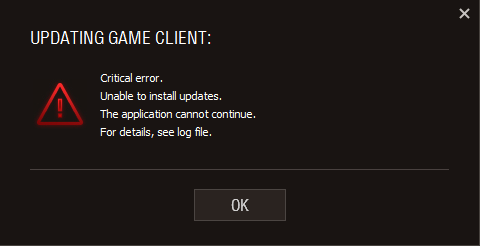 Game Center don't like it when you don't run it as an administrator and it's quite common that it have issues with active WG processes which is easiest to get around by restarting your computer, if that don't work try killing every WG related process via the Task Manager. Also you tried everything in the article above? Removed WoT, tried reinstalling WG center unable to do so. Sent a ticket. Hmm what exactly happens when you try to uninstall Game Center? I have not removed the Game Center, I removed WoT only and that did not work. Might try game center next. Thank you for contacting Wargaming Player Support. I am sorry for this inconveniences. We are aware of this problem and our specialists are currently working hard to solve this situation as soon as possible! I wish you a lovely day and good luck on the battlefield! So I guess its wait and see and miss the US TD marathon. Edited by azatoth668, 07 April 2019 - 02:34 PM. It breaks launching the game. So you have to reinstall it to play again. Nah it's rather the reverse for most, Game Center breaks the ability to launch the game so you uninstall it and install the old stable launcher instead to get stuff working, however in this case it seemed like there was installation problems.